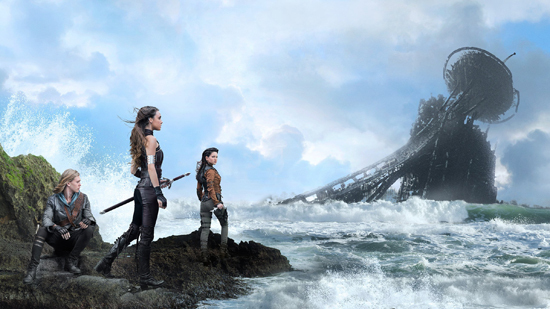 Adapted from a trilogy of novels by author Terry Brooks, published between 1977-1985, The Shannara Chronicles is a lavish fantasy epic from MTV, written by Smallville creators Alfred Gough and Miles Millar. Those writers were also responsible for the movies Shanghai Knights, Spider-Man 2 and Lethal Weapon 4, and more recently created the AMC TV series Into the Badlands, so they clearly have a bedrock of experience with projects and subject-matter a show like Shannara requires. The slightly daunting issue with fantasy drama is knowing you're about to be hit by a tonne of exposition, as it's very difficult to explain the workings of an imaginary world while introducing a story and characters. It helps that many fantasy shows are, broadly speaking, doing many of the same things, so Shannara using terms like "gnome" and "elf" aren't really going to bamboozle anyone—and we all expect there to be a battle between the forces of Good and Evil. In that regard, Shannara doesn't disappoint, or present us with anything terribly original. Princess Amberle (Poppy Drayton) passes an Elvish ritual to find seven Chosen, servants of the Ellcrys (an enormous tree, said to be keeping an army of demons in the Forbidding realm), but is troubled when touching the tree presents her with a nightmarish vision of a wasteland where her kingdom has been destroyed by invading demons and the Ellcrys has been incinerated. Elsewhere, a Druid called Allanon (Manu Bennett) awakens from a long slumber and goes to see the Elven King, Eventine (John Rhys-Davies), where he becomes aware the Ellcrys is dying. Soon, Allanon joins forces with a young elf called Wil Ohmsford (Austin Butler), who has been given powerful Elfstones by his dying mother, and together they go on a quest to rejuvenate the Ellcrys. Meanwhile, a villain known as the Dagda Mor manages to break free of the Forbidding realm because of the Ellcrys's poor health, and begins plotting to destroy the tree and the Elves once and for all. A lot of strange names obfuscate what's really a very simple story of a magical tree that needs to be healed, before an army of nasty creatures escape their prison and destroy the world (or, rather, the Four Lands). What works about this feature-length premiere is a certain level of confidence and visual clarity. It really looks expensive, almost filmic in presentation—helped by having movie director Jonathan Liebesman (Battle: Los Angeles, Clash of the Titans) behind the camera for these first few episodes. Liebesman isn't a particularly amazing director (he was nominated for a Golden Raspberry for Teenage Mutant Ninja Turtles in 2014), but as someone with experience working on multi-million dollar projects he definitely copes with the relatively small scale of this show. But that's not to discredit what Shannara manages to achieve, because it's a feast for the eyes; beautiful New Zealand location shooting, brilliantly augmented with CGI that makes the environment look like the love-child of Lord of the Rings and Avatar. It's truly gorgeous; like a 1970s fantasy novel cover brought to life. And while television's hardly the poor cousin of feature-films these days, it's worth saying the special effects and costumes are also very good. I don't know if every episode is going to look as stylish as this opener, or have as much money to splash around and stave off boredom, but for now Shannara does a convincing job of making any channel-surfers think they've stumbled upon a big-budget movie they missed at the cinema. Well, kind of. It still has the whiff of a (very good) Syfy Original Movie about it, occasionally. In terms of things that ultimately matter more than visual glossiness (story, character), Shannara's quality is less certain. It's all very broad right now, with a tomboy princess, disbelieving hero, gruff mentor, and stately king. They're just types we've seen many times before, capably played, but nothing to really get very excited about. But I do enjoy seeing Spartacus's Manu Bennett on-screen, even if he's always playing the same character in different costumes, and there's something to be said for populating the show with actors you don't really know. It helps you buy into their characters a little more, as they don't bring any baggage—although, yes, they're all insanely handsome and pretty. It remains to be seen if the performances will be enough to lift the show, as much of this premiere relied on spectacle. There are only 8 episodes left, and I'm aware they're actually adapting the second novel (The Elfstones of Shannara) as the first season. Presumably, the first novel's events will serve as backstory to weave into this year's plot via flashback? I don't really know, but it would seem Shannara has a finite lifespan, unless Gough and Millar plan to embellish events, mix the three books together somehow, or perhaps even take things in fresh directions if this proves a success. 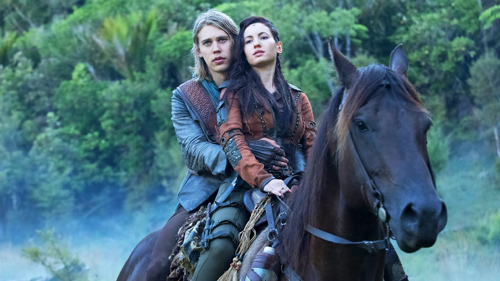 Will The Shannara Chronicles be a hit? I think it's definitely a very good example of a particular type of fantasy drama many people love to watch, but personally I need to see what the next three or four episodes are like. If it can keep my interest when the special effects are reduced in prominence and the location shooting's scaled down, it stands a good chance of making me a fan. I'm just hoping the story itself will really grip me now the setup's been dealt with, and to enjoy watching these characters interact with each other. Gough and Millar have a lot of experience where it counts on TV and with film, so I'm hopeful there's more to Shannara than jaw-dropping vistas and slick CGI. But if you just want a premiere to plant seeds and look amazing doing it, you can do far worse than this.